Without a doubt Mahabharata is the most exciting tale that ever existed. Each version, re-telling and book based on Mahabharata leaves me with so many thoughts and curiosity. Dr Shinde’s book was no different in that aspect but again, it was different in every other aspect. Over the centuries, different writers and artists has presented different voices to this great epic. From Karna, Krishna, Draupati, Supriya to Shrikandi- everyone has been offered a point of view- an opportunity to judge the great war from their lenses. Novelty of this book is that it offered a voice to otherwise silent warrior whose heroic contribution to the war is often taken as granted, and only married with the silence inspite of the grandest conflicts were circling around him. Arjuna, the demi-god, son of Indra, Pandu and Kunti’s third son, an ace archer, compassionate lover, artistic and thinker, Krishna’s friend and cousin and the pride of Dronacharya, takes a central voice. His voice is accompanied with that of Draupadi. They take turns to narrate the events starting from Drupadi’s Swyambar to the after-math of the great war. Mahabharata is full of so many complex characters that it is challenging to accommodate everything in single book. In this personalized point of view of the couple, they choose to narrate events that were too close to them. However not everything works out perfectly in the book. Some of the conversations and conflicts between Draupadi and Arjuna sounded too modern for their times. Also the book was written with the pre-assumption that the readers had sound knowledge of Mahabharata and Hindu mythology. In the middle of the book, the language becomes too poetic. Even during the best of their days, like the time when Indrapastha was flourishing, there was always despire in their tone, always certain unhappiness. We all know that Mahabharata is a tragic tale by the end, but we don’t see emotional journey of highs and lows. Also there was a case of lost opportunity when characters like Bhisma, Drupad and Kunti were used in a single dimensional style. However, the book makes a good come back in the final act. War is always the most exciting part of the story and always expected to raise the bar. Dr Shinde choose not to include event by event description of the war, that I believe worked for the book. The best part was the emotional change in Arjuna post murder of Abhimanyu. An argument between Kunti and Arjuna after Karna’s death was delightful and offered a prospective that was absent from all the other retelling of the epic. At the end, the author also included some explanation of the exploration of myth, that I enjoyed so much that I wished that the entire book was based on it. To conclude, I believe this book is a great effort to give a voice to Arjun who is often relegated as a silent hero. I liked that the author didn’t over glorify Karna, who is often popularized as a tragic hero of this tale, rather then a side-kick to Duryodhun. 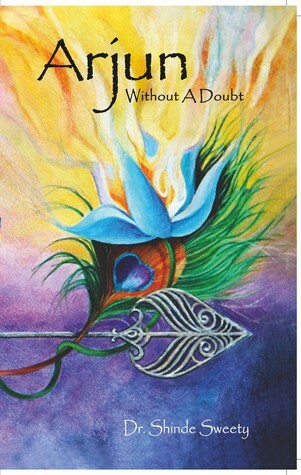 I gave Arjun, Without a Doubt by Dr Sweety Shinde 3/5 stars on goodreads, only because there were no option for 3 and half stars. I wish that it is a start of writing career that will give us many interesting books in the future. PS: Dr Sweety Shinde is a good acquaintance and had also gave me a free copy of the book. However that didn’t influence my review. You can connect to Dr Shinde via her blog or through her goodreads profile. Thank you, Avi! I enjoyed reading your journey through the book. Thanks a lot Doc. Since I took too long to read the book, I guess the journey was also too long. Thank you for writing this book. The pleasure was all mine. And yes, eager to know what questions were brewing in your mind. Shoot! I promise I wont take offense . P.S- Awaiting your questionnaire list.